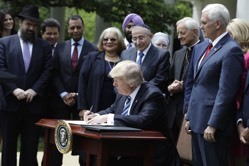 During his address, Trump invited some of the sisters from Little Sisters of the Poor, who had recently won a lawsuit against the Obamacare birth control mandate. He congratulated them—along with their lawyer—on their victory, quipping that he might like to use their lawyer too sometime. According to Fox News: The order directs the IRS to exercise maximum enforcement discretion to alleviate the burden of th e so-called Johnson Amendment. In addition, it instructs the Treasury Department not to target the tax-exempt status of churches and other institutions if they express support for political candidates. Next articleAmericans fond of Bible; they just don’t read it!